Leading oil-fired domestic boiler manufacturer, Hounsfield Boilers, has launched new models extending the range of the company’s market leading Tuscan oil boilers. The company’s new Tuscan wall-mounted heat-only oil-fired boilers are available in two models, the internal and the external, with an output of 12 – 19kW. Both models are equipped with the same high-specifications installers have come to expect from Hounsfield’s Tuscan range, namely life-long air-craft grade stainless steel Teflon cored flexible hose, that will not rot or degrade, a Bentone BF1 burner, plus thicker insulation to retain heat and reduce noise. The new external wall-hung models also include a frost thermostat which senses water temperature rather than air, tough weather proof casing and a compact 640mm x 760mm x 320mm size. Every boiler undergoes over fourteen quality checks during manufacture including the burner which is test fired and is pre-bled with kerosene, the oil filter and fire valve kit comes pre-assembled; features designed to save time and hassle for the installer. 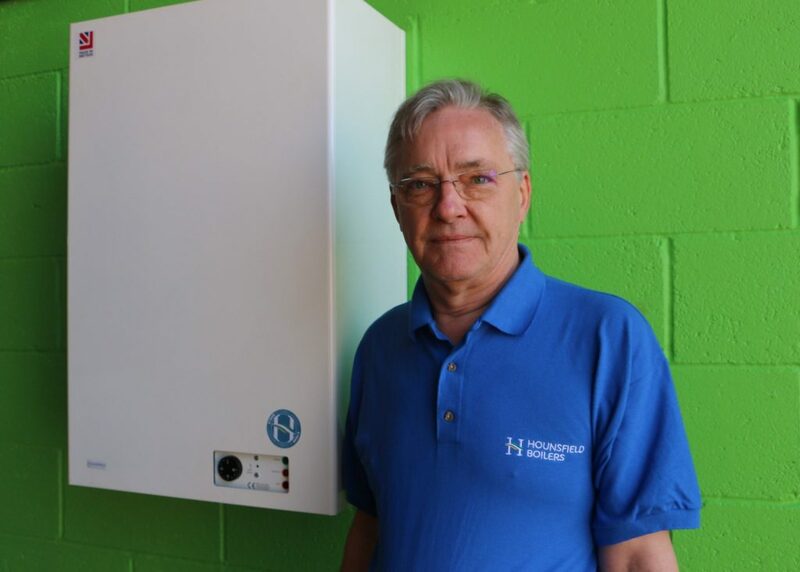 Hounsfield Boilers was set up in 2008 by Andrew Hounsfield after 30 years in the boiler industry. Andrew had worked for some of the biggest UK boiler companies and noticed that there was no product on the market that could offer high quality, long-lasting components at an affordable price. With his engineering background he designed a revolutionary oil-fired boiler that is easy to install and has high performance with a host of features not found on any other boiler in the marketplace. Hounsfield Boilers can be ordered via merchants or direct from the company. To discover more visit www.hounsfieldboilers.co.uk. Andrew Hounsfield with Tuscan wall hung boiler.